A computer-generated image of the International Prototype kilogram (IPK), which is made from an alloy of 90% platinum and 10% iridium (by weight) and machined into a right-circular cylinder (height = diameter) of 39.17 mm. The IPK is kept at the Bureau International des Poids et Mesures (International Bureau of Weights and Measures) in Sčvres on the outskirts of Paris. Of all the standard units currently in use around the world, the kilogram – the official unit of mass in the International System of Units (SI) – is the only one that still relies on a physical object for its definition. But revising this outdated definition will require precise vacuum-based measurements that researchers are not yet able to make, said Patrick Abbott of the National Institute of Standards and Technology (NIST) in Gaithersburg, Md. Abbott will present an overview of current efforts in vacuum technology to redefine the kilogram at the AVS 60th International Symposium and Exhibition, held Oct. 27-Nov. 1, 2013, in Long Beach, Calif.
Abbott will also describe his NIST team's development of a novel system to allow a direct comparison of an object being weighed in a vacuum to one outside a vacuum. 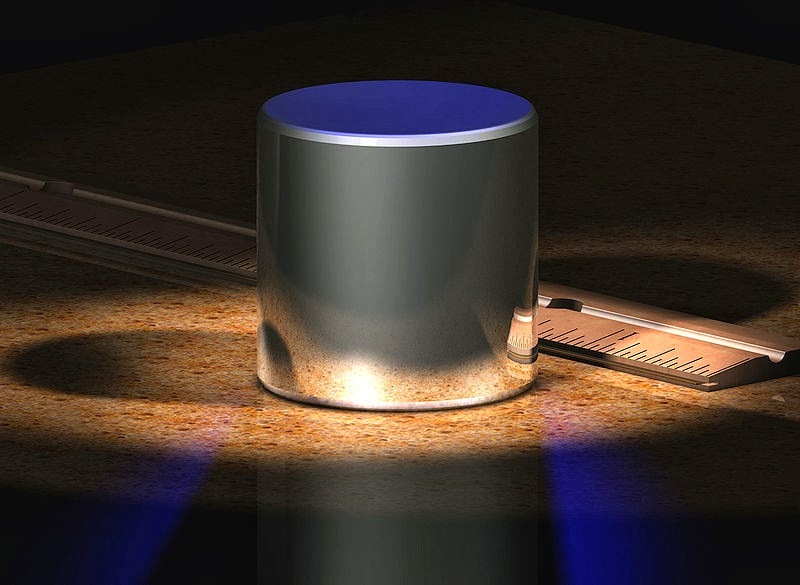 "Ours is the only project of its type in the world," Abbott said of his team's work, "and we believe that it will be critical in the accurate dissemination of the redefined kilogram." The official kilogram, called the International Prototype Kilogram (IPK), is stored in a bureau just outside of Paris, France, and has served as the standard to which all the nations' prototypical kilograms have been compared for the last 125 years. Every few decades, the national prototypes are carried, usually by hand, to France, where they are measured against the IPK. But discrepancies between the national prototypes and the official specimen have been increasing at a rate of 0.050 milligrams (mg) every 100 years. And no one knows why. "It's not really clear if the IPK is getting lighter or the national prototypes are getting heavier," Abbott said. Loss of mass due to wear is unlikely because the IPK is hardly ever taken out of its vault. To address these discrepancies, an international assembly of metrologists – researchers who study the science of measurement – decided in 2007 to wean itself off of the prototype and redefine the kilogram using something more reliable: a constant of nature. The metrologists eventually chose Planck's constant, which describes the relationship between the energy of a photon and the frequency of light it emits. Its value has been measured with a relative uncertainty of between 30x10-9 and 35x10-9. However, to assure agreement between the current IPK system and the Planck-defined kilogram, researchers will need to improve their measurements to a relative uncertainty of 20x10-9. And to get better measurements, they will need the ability to perform state-of-the-art metrology in a vacuum. Currently, researchers use two types of experiment to measure Planck's constant, and both require vacuums. One method involves determining the number of atoms in a high-purity silicon sphere with a nominal mass of 1 kilogram. The other, called the watt balance, measures the constant by an indirect or "virtual" comparison of mechanical power to electromagnetic power. Using a vacuum ensures that there is no contamination from particles in the air and reduces uncertainty in some of the measurements that are conducted with laser interferometry. Researchers using the watt balance experiment at national measurement institutes around the world are working to find the materials best suited to measuring Planck's constant with this method. Efforts are also underway to find a level of vacuum that is good enough to get results without being too difficult to build or maintain. So far, researchers are on track to having a new definition of the kilogram by 2018, Abbott said. While many teams around the world work to improve measurements of Planck's constant, Abbott's group is looking beyond redefinition and toward making these measurements practical. "Whenever redefinition occurs, a robust method will be required to disseminate the kilogram realized in a vacuum to a world that works in air," Abbott said. His group is creating a system that will bridge the vacuum-air interface using a magnetic suspension technique. The set-up will allow a direct comparison between the mass of a standard kilogram in a vacuum and the mass of a specimen in the atmosphere of a normal room. Presentation VT-MoM1, "The Important Role of Vacuum Technology in the Redefinition of the Kilogram," is at 8:20 a.m. Pacific Time on Monday, Oct. 28, 2013.